During this years Easter break I took the opportunity to visit the Wimbledon Museum and take a tour of the grounds of Wimbledon. Entry to the museum costs �50 for adults and �50 for children (U16), and if you want to take a guided tour of the grounds this will cost you �.75 and �.75 respectively and this includes entry to the museum. 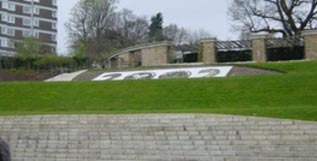 For more information see the Wimbledon Museum section of the official Wimbledon site. An Eye Opener I would definitely recommend both. The tour itself lasts about one and a quarter hours and our guide was both enthusiastic and highly knowledgeable. What you immediately notice as you embark on the tour, is just how different Wimbledon is from the scenes that you see during the Wimbledon fortnight. Gone are the glamour and glitzy surroundings, to be replaced by what can only be described as something that resembles a building site. 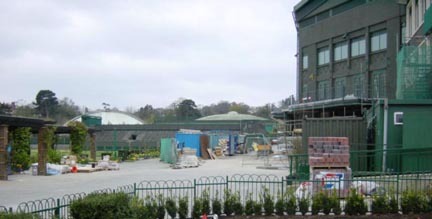 The photograph shows the scenery outside the famous Centre Court. Of course the main thing is that during the fortnight, SW19 does indeed look the business, and the scenes we saw ensure that these standards are met year after year. An eye opener nevertheless!!!. 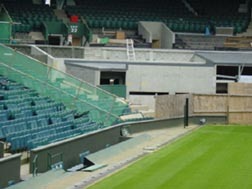 Building Work On Centre Court One of the highlights of the tour is the chance to go inside the Centre Court and the recently rebuilt number one court. 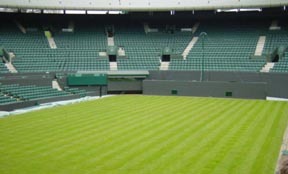 Plenty of work was been carried out on the legendary Centre Court in preparation for the 2002 Championships, with both the Royal Box and the area where the players family and staff sit, in the process of being renovated. A Scene From Court 1 The scene was slightly different on the new number 1 court. As you would expect there was no need for any work to be carried out on this arena given that it has only been in use for a couple of years. The Players Interview Room The tour took us through the grounds and we were able to see some of the outside courts and the newly built number 18 court. We were also taken inside the Millenium Building where we were shown the main press room where the players are interviewed after a match. The room itself consists of around 150 seats for the worlds media, and the player is given a large desk in which they sit at, in readiness for an interrogation. Not an ideal situation for the player who has just lost a match!!! Inside this building are the players changing rooms, but perhaps the only disappointment of the tour was that on the request of the players entry to these facilities was forbidden. 'Henman' Hill Back outside we were shown the infamous Henman Hill, located outside Number 1 Court where many tennis fans stayed to watch Timothy during his quest on last years Championship. Wonder how many other people are lucky enought to have an hill named after them? Overall the tour was good value for money, regardless of whether you have or haven't been to the Championships. The museum too was fine value (although photography was banned) and the Wimbledon trophies, and rackets and items of clothing from past and present players were just some of the artefacts on display.